Perfection by definition is the condition, state or quality of being free from all flaws or defects. And by example, perfection takes different forms. The perfect body. The perfect career. The perfect man/woman. The perfect life. I can say that for the last few years of my life, I have been on a quest to make myself, my life, and my surroundings---well, perfect. As a recovering perfectionist, I was once bogged down in every single detail. But now I am learning to accept some things for what they are; right now, in this moment. It has not been easy to overcome my addiction, but one of the major components to my healing has been taking a hard look at all of the things I blocked by insisting that it line up with some ideal picture I carried around in my head and heart. When I started this inventory, I was surprised at how critical I'd been of everything and everyone in my life but perhaps the most heartbreaking was the way in which I'd lost my faith in the race to come out on top. Now, I am no one's first lady, deaconess or minister but I once had a relationship with God that I was very proud of. My faith was unwavering, and my life had a general ease to it that I contributed to my walk with Christ. Prayer was second nature to me and I was generally happy to share God with others. And then, I hit the age of 25. The age that I thought I'd have it all together by. But I looked around and felt helpless. I felt that I had nothing to show for my walk with God and though I believed that he was the vessel for all of my blessings, I saw people who seemed to not know him at all---living the life I dreamed of leading. I was frustrated, fed up, and disappointed. And thus, started my spiral. I wanted to hide myself---my not being a finished product could not possibly be attractive to either lovers or friends. I isolated myself and insisted that it was better that I not bring anyone else down to my level. Never mind that I'd run a successful magazine, created work that I was proud of, traveled to some of the places I'd always wanted to see---I wasn't where I thought I should be. So how could I be proud of me? How could I tell someone about God and have them look at my (what I thought was) shipwreck of a life? And what's more: how could I believe in a God who saw my hard work, passion, and desires, but blatantly ignored them? Imagine that. Foolishly, I felt like the being that stretched the stars across the sky needed to prove itself to me. Then I began to attack myself. Maybe it was me. Maybe I wasn't a good enough woman/friend/daughter/Christian for God to answer my prayers. How could I fix that? And hell, why was God being so hard on me while letting everyone else be imperfect and still get ahead? Why was my life so much harder just because I was flawed and had made mistakes? GOD WAS NOT PLAYING FAIR. But in my usual perfectionist way, I figured I'd fix it. I would do everything right and force God's hand. 1+1=2 after all, right? If I am crossing every t and dotting every i, then God has to give me what I want. And if he doesn't, then that means I can do more. I can work harder. Pray harder. Volunteer more. Workout more. Eat better. Not have a social life. Prove to Him that I was worthy of his love, blessings, and honor. I'd even pretend to be happy while doing it all because that was the only way God would be pleased with me enough to grant me the desires of my heart. Then, and only then, could I trust God the way I once had. 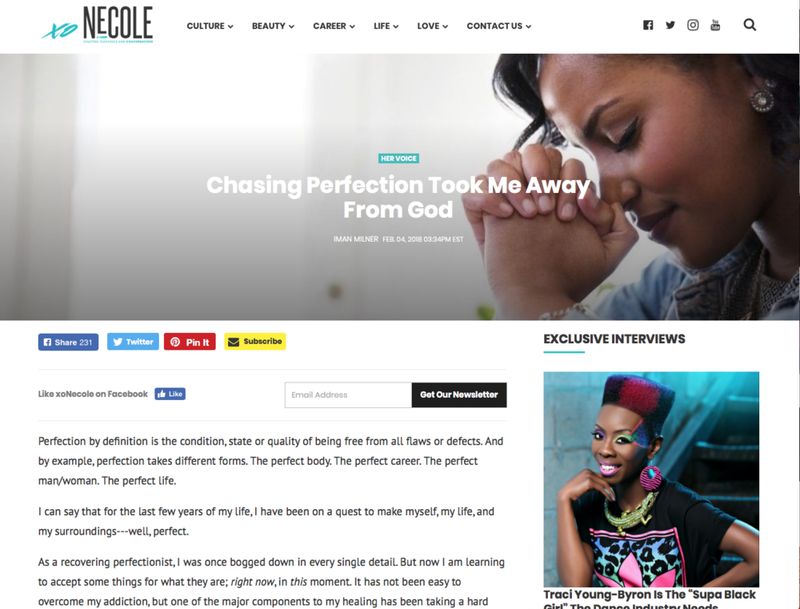 Read the full article on XoNecole here.